In this age of mass surveillance in the United States in an effort to preempt acts of terror like that meted out against the congregation of the historical Emanuel African Methodist Episcopal church in Charleston, South Carolina, it is hard to believe that the wide net of surveillance cast both online and offline by US law enforcement missed the perpetrator of the atrocity despite eye-popping red flags. On 17 June 2015 an alleged "white supremacist" gunned down nine people - six women and three men - at the Emanuel AME church in Charleston, a historical church linked to the civil rights movement. 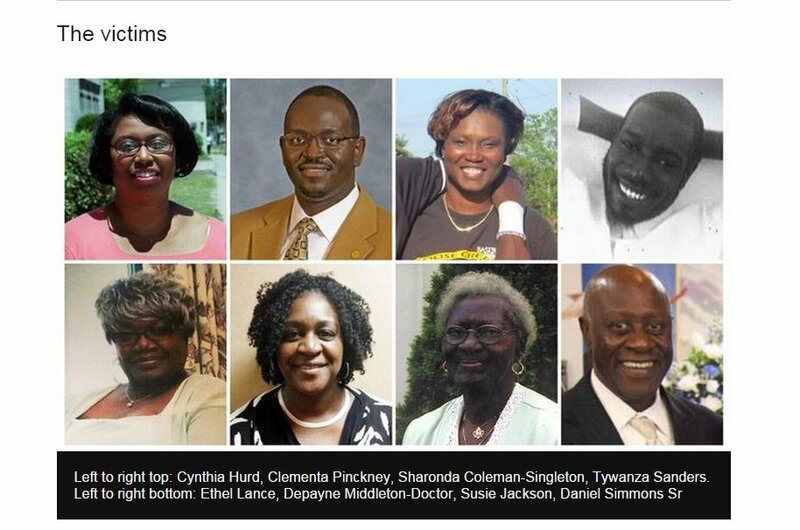 The nine victims of the massacre - all African Americans - reportedly sat in church with the perpetrator, Dylann Roof, 21, in a bible study group and prayer meeting for an hour before the massacre. Worthy of note that the perpetrator who, according to his childhood friend, wanted segregation between whites and blacks was known by law enforcement and had been previously arrested - besides having a racist manifesto online threatening violence. According to a BBC report, he drew the attention of the police at a shopping mall in February when he walked into the mall all dressed in black and asked strange questions to shop employees. He was found to be carrying a drug without prescription and was arrested and charged for drug possession. He was also banned from the mall, and was arrested for trespassing at the same mall two months later. Dylann Roof had a racist manifesto online - which according to the New York Times reveals that the case of Trayvon Martin, a black teenager killed in Florida in 2012 triggered his racist rage. The nearly 2,500-word manifesto, which was discovered on a website described blacks as being inferior, amongst other things. "I have no choice," the manifesto reads. "I am not in the position to, alone, go into the ghetto and fight. I chose Charleston because it is the most historic city in my state, and at one time had the highest ratio of blacks to whites in the country. We have no skinheads, no real KKK, no one doing anything but talking on the internet. Well someone has to have the bravery to take it to the real world, and I guess that has to be me." According to the New York Times the website that carries the manifesto was first published in February - four months before the rampage - under the killer's name, Dylann Roof. The New York Times reports that the Charleston Police Department and the FBI were aware of the website and are "taking steps to verify the authenticity" of the postings on the site, which features a photo of Dylann Roof posing with a handgun and the confederate flag. His roommate reportedly told ABC News that he (Roof) planned the massacre for months. Mindful of the numerous red flags and mass surveillance by US law enforcement reportedly intended to stop such attacks, Dylann Roof should have been stopped before the attack. Just two weeks before the church attack, a certain 26-year-old Usaama Rahim who was under surveillance was followed by a police officer and an FBI agent and killed in Boston. According to the BBC, Usaama Rahim was under 24-hour surveillance because he was considered a threat to the public. It is inconceivable why Roof, despite having all the earmarks of ticking time bomb, was not considered a threat to the public and perhaps placed under surveillance like Rahim. Roof posed a threat to the public and he made no secret about it, but unlike Rahim he was not followed around. Perhaps his planned massacre was not considered serious enough to earn him a place in the controversial surveillance program. Or perhaps US law enforcement does not consider racist hate crime against African Americans a crime worth dedicating resources to abort. Maybe stopping hate crime against African Americans in its tracks it not a priority. I refuse to believe that law enforcement was completely unaware of Dylann Roof and what he was capable of. Someone in law enforcement somewhere must have read the racist manifesto in which he "chose Charleston" for his " white fight". The plan was out in the open. Someone must have spotted it and decided not to act against it. If Dylann Roof fitted the racist profile of what many people in society consider, wrongly of course, nowadays to be a terrorist: non-white and Muslim, he should have been stopped. He should have been placed under surveillance and approached by a police officer and maybe an FBI agent at the Emanuel AME church on that fateful night - in the same way law enforcement officers approached suspected terrorist Usaama Rahim in Boston. I share the view that it is important to call the Charleston attack "terrorism", and all other similar attacks that pass as hate crime. The perpetrator's motive was to attack the historic African American church, kill African Americans and strike terror into the hearts of survivors and African Americans in general. Officials and the media chose to call it a "hate crime". Others called it a "tragedy", but in my view it is terrorism. All acts of terror are technically hate crimes. It is unfortunate that an act of terror is described as a "hate crime" based on what the perpetrator looks like or beliefs in. Dylann Roof should have been on a watch list and followed closely like other suspected terrorists. The nine victims of the Charleston church attack add to the long list of victims of America's senseless gun laws and a law enforcement system tainted by racial profiling. If Dylann Roof was not white and blonde chances are someone in US law enforcement would have paid closer attention to his online postings, which include the racist manifesto in which he "chose Charleston."